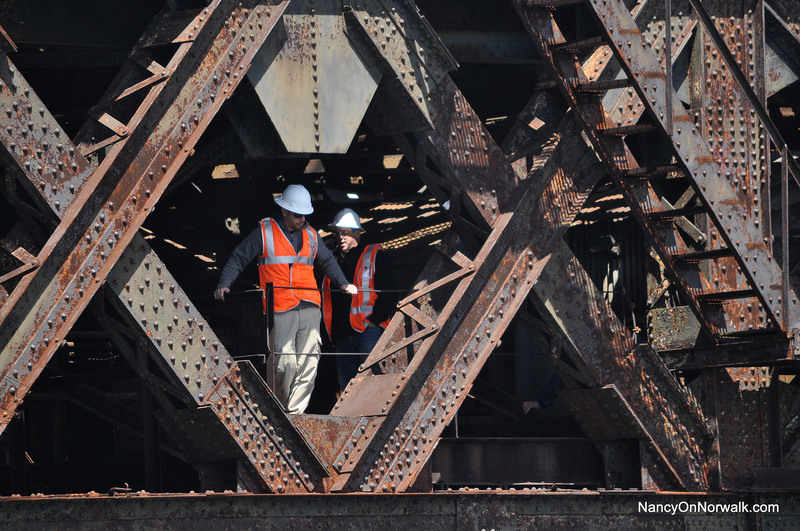 Workers on the aging Walk Bridge in 2016. Ned Lamont is off to a solid start in attempting to reduce cynicism about our state’s ability to use taxpayer dollars wisely. He is addressing environmental problems and helping businesses create more jobs. Among other upcoming opportunities to further this work, his leadership is needed to chart the path to Connecticut’s newly legislated 2030 goals to reduce climate pollution by 45 percent and increase renewable energy to 40 percent, which will create thousands of new jobs here in the state. Over the next two years, his budget can improve water quality while saving up to 20 percent by investing smarter in nature-based solutions that will make Connecticut’s neighborhoods more resilient to floods associated with increasing storms being felt along our inland rivers and coast alike. In addition he can assure that tens of thousands of middle class and low income families in our state save thousands of dollars each year through programs that caulk leaks, install insulation, and update inefficient heating systems—services provided by local small businesses. During his campaign Lamont noted the cynicism created when the legislature stole $145 million in energy efficiency funds paid by Connecticut residents on our electricity bills and intended for energy efficiency benefits. He must work with the legislature to reverse this unseemly job-killing raid and protect these funds in future budgets. Right now in Norwalk, there is a striking opportunity to demonstrate this kind of fiscal and environmental responsibility. An overblown scheme to rebuild that city’s iconic Walk Bridge railroad bridge — which the Norwalk Hour labeled a “Billion Dollar Boondoggle” in a front page banner headline — can be replaced by a simpler, less costly and less disruptive design. There is certainly a need to repair or replace the existing bridge, built in 1896, as it has failed to close on several occasions—causing serious travel disruptions. The boondoggle comes in because the Connecticut Department of Transportation selected a massive lift bridge design, despite the fact that today there are just a handful of recreational sailboats and an occasional barge that need a bridge to open. An opening railroad bridge poses major and unnecessary safety, cost, economic, reliability and environmental risks. This approach and its associated projects would cost the state over $1.2 billion. To put this in perspective, that’s nearly twice the CT DOT annual budget of under $700 million; the entire state Special Transportation Fund spending is around $1.5 billion per year. The state has refused to consider the alternatives of a lower-cost fixed bridge, or repairing and welding shut the existing bridge, leaving hundreds of millions of dollars in potential savings on the table. We are calling on the governor to undertake a 90-day engineering review to answer a few critical questions before committing the state to spend $1.2 billion. Question 1: Do we really need a massive lift bridge at this location, given the now vastly-diminished navigational uses of Norwalk Harbor? In 2016 the bridge only opened 78 times, for a few sailboats and tall tugboats. Shorter tugboats are available to move the few barges under a low level fixed bridge. Question 2: How much would a fixed bridge save the State of Connecticut? Beyond the taxpayer impact, there is the economic disruption to South Norwalk that will occur from proceeding with the current plan. The Maritime Aquarium, the state’s second most visited attraction, may or may not survive, given the anticipated loss in visitors during five years of construction. The effects on the SoNo restaurant community would in turn be major, as aquarium visitors make up a hefty share of restaurant revenues. The local oyster industry, with over 20 boats that go out daily, may be threatened by the disruption of the toxics-laden sediments that would be disturbed in construction. What the state’s own Office of Policy and Management requested, back in 2015, was for the state to look at fixed bridge alternatives. The DOT declined, citing a supposed decision by the Coast Guard to prohibit a fixed bridge. In fact, however, the Coast Guard has a process for allowing river crossings that don’t “unreasonably” interfere with navigation. This case is a textbook example. An expedited, independent, 90-day examination of the available options would pinpoint what savings are possible and allow for the review of existing height-fixed bridge alternatives that the state has thus far not taken seriously. The incoming governor has many opportunities to restore faith in our state government. Few are as immediate and tangible as avoiding a bridge boondoggle in Norwalk. Fred Krupp is President of Norwalk Harbor Keeper, and Curt Johnson, President of Connecticut Fund for the Environment/Save the Sound. This op-ed previously appeared on CTViewpoints.org. Well done Fred Krupp. The enthusiasm for the Boondoggle Bridge by Mayor Rilling and Sen. Duff illustrates why Norwalk’s governance is held is such low esteem by City residents, neighboring towns and especially by the larger business community. The proposed largest public works project in the City’s modern history illustrates the consequences of electing officials lacking any business or management ever-evidence. Or even freshmen level knowledge of governance serving the public. It’s especially revealing that Mayor Rilling refuses to estimate the huge costs of this Boondoggle upon City residents, businesses and the City itself over several years. Our Mayor has no problems with seeking funds to study Manresa Island, but none for consultants to estimate the tens and tens of millions of costs from this unnecessary project. Given the utter indifference of Mayor Rilling and local Democrats to this Boondoggle Bridge – likely Rilling’s Legacy – our only hope is for citizens to protest to Gov. Lamont who unlike our local officials ought have good knowledge of costs and benefits. The Boondoggle Bridge is the greatest failure of City governance in the modern era and again illustrates why our neighbors disparage Norwalk as the “hole in the middle of the donut”. Why can’t Mayor Rilling explain why he favors a project powerfully protested by an entire City ? Is it becasue our One Party local governance is immune to criticism ? Or is it a matter of just basic lack of competence ? Clearly if we don’t protest the Boondoggle will proceed. Thoughtful and positive approach. Thank you. Thank you both, Fred Krupp and Curt Johnson – a thoughtful and thorough statement which puts the Boondoggle aspect of this potential disaster in South Norwalk front and center. I happen to have a copy of an engineering report and estimate from a few years ago a local business owner shared with me – the report is focused on an engineering analysis to repair the Walk Bridge, based on credible, professional assessments and taking some modeling from similar swing bridges in the Bronx, etc. Are you familiar with such a report and would it be in any way useful to you in this proposed 90 – day review? If so, happy to share. Please keep writing and seeking the spotlight – and let us know how we may help (in addition to writing Gov. Lamont). Are there petitions? Surveys? A fund or otherwise designated projects to support your work on this issue? I think the problem is the ladder, it’s a matter of lack of competence by this entire administration. Weak mayor weaker council.